There's a lot of buzz about the just-revealed internal memos from the National Organization for Marriage (NOM) that make plain their divisive racial strategies to oppose marriage equality. The key strategy NOM has employed is wedge politics, that is, seeking to drive a wedge between African Americans and Latinos on one side and those in the LGBT movement on the other. The strategic goal of this project is to drive a wedge between gays and blacks -- two key Democratic constituencies. Find, equip, energize and connect African American spokespeople for marriage; develop a media campaign around their objections to gay marriage as a civil right; provoke the gay marriage base into responding by denouncing these spokesmen and women as bigots. No politician wants to take up and push an issue that splits the base of the party. Fanning the hostility raised in the wake of Prop 8 is key to raising the costs of pushing gay marriage to its advocates and persuading the movement's allies that advocates are unacceptably overreaching on this issue. To say that NOM's strategy is racist is stating the obvious. Sometimes it's worth stating the obvious, but I want to make a slightly less obvious point, and that is that the revelations about NOM's racial politics highlight the LGBT movement's need for a racial justice agenda. The truth is that African Americans and Latinos are just as likely to be gay, lesbian, bisexual, and/or transgender as white people. Moreover, Zack Ford makes the excellent point that "NOM's tactics seek to erase an entire population of people who live at the intersections of these experiences, limiting their ability to fulfill their complete identities." That's exactly right. The NOM strategies not only are racist but they assume that "gay" and "black" or "lesbian" and "Latina" are somehow mutually exclusive categories, that you can't be both gay and black, or lesbian and Latina. The reality is that the LGBT movement has also ignored the "both/and" identities. 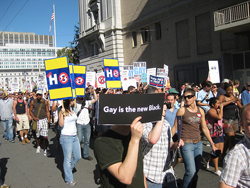 How else can we explain the popularity of the "gay is the new black" slogan, popularized during the Prop 8 campaign? We're right to get outraged over NOM's racial strategy to divide "gays and blacks," but this division is one we have to take a serious look at within the LGBT movement, which currently lacks a racial justice agenda. What would it look like if the LGBT movement had a racial justice agenda? Well, for starters, we'd see our struggle for equality tied to other movements for justice, not just by analogy. So, for example, there's been a noticeable silence about Trayvon Martin on most of the mainstream gay blogs, probably because most (white) gay folks don't see the case as "our issue." But as Zach Stafford recently pointed out here on HuffPost, gay folk should care about Trayvon Martin because all of us who are "outsiders" -- whether because of sexual orientation, gender non-conformity, or race -- can be targets of violence. When we say that the gay right movement is the new civil rights movement, we're playing into the divisive racial politics of NOM. We have to do better than "gay is the new black." We have to see that the fight for sexual equality hasn't replaced the fight for racial equality, because that's not over. When the LGBT movement moves beyond shallow slogans like "gay is the new black" to embrace a racial justice agenda that sees our struggle as tied to others, then we'll have truly won a victory against opponents like NOM that can only see "gays and blacks" as an easy place to drive a wedge.